In order to be able to set an axle properly, one must have the right principle underlying the method. 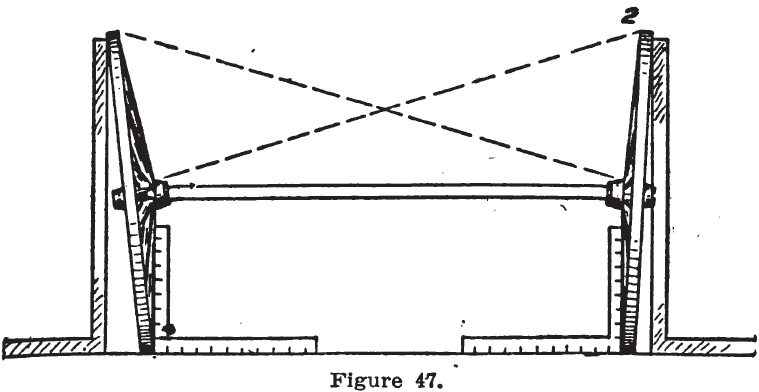 I hold that the fundamental principle is the “plumb spoke.” There are different opinions in regard to what is meant by the “plumb spoke.” Some hold that the measure should be a gravity measure through the center of the spoke, while others hold that the right angle should be measured from the inner side of the spoke, as shown in Fig. 47. I hold that the gravity measure is the correct measure, for we know that the spokes are tapered, and measure along the taper would mean one-fourth inch under plumb spoke. The wheel should stand to the plumb spoke; but if it does when not loaded, we find that a loaded vehicle stands over plumb. Therefore, in order to insure plumb spoke, when the vehicle is loaded, which is essential, the angle must be set so that the wheels lean out. This is called pitch, about the taper of spokes, and then the idea of setting the axle to a plumb spoke, as shown in Fig. 47, is also correct. The pitch will then be right and in conformity with the dish of the wheel. Axles are set by gauges, but then the dish must be observed, and the gauge set so as to get a plumb spoke, where the wheels have a different dish. See Fig. 47. Here one wheel has more pitch than the other, because of the different dish, but both wheels will here have a plumb spoke and track. By “gather” is meant a condition of the wheel where the front side of the wheel stands in a little – from one-fourth to three-eighths of an inch – in a buggy. This is to prevent the wheel from pressing against the nut. A little gather will force the wheel against the collar of the spindle which is best. When the wheels are of the same dish, the axles can be set right by measuring with a rod as indicated by the dotted lines, and a rough estimate of the pitch is, where the felloe is one inch thick, to have the wheels stand 1 1/2 inches wider at the top than at the bottom of the rim. By this is not meant 1 1/2 inches from the top of rim to hub. If the wheels are given too much pitch, the axles will wear, as shown in Fig. 48. In observing the rules now given, a vehicle will run easily, for friction is reduced to a minimum.